Egypt is a Muslim-majority country, but the Zabbaleen are mainly Coptic Christians. Christian communities are rare in Egypt, so the Zabbaleen prefer to stay in Mokattam within their own religious community, even though many of them can afford houses elsewhere. The local Coptic Church in Mokattam Village was established in 1975. After the establishment of the church, the Zabbaleen felt more secure in their location and only then began to use more permanent building materials, such as stone and bricks, for their homes. Given their previous experience of eviction from Giza in 1970, the Zabbaleen had lived in temporary tin huts up till that point. In 1976, a large fire broke out in Manshiyat Nasir, which led to the beginning of the construction of the first church below the Mokattam mountain on a site of 1,000 square meters. Several more churches have been built into the caves found in Mokattam, of which the Monastery of St. Simon the Tanner is the largest, with a seating capacity of 20,000. In fact, the Cave Church of St. Simon in Mokattam is the largest church in the Middle East. The Nagib family lives in Manshiyat Naser — also known as Garbage City — an impoverished Coptic Christian neighborhood nestled in the jutting desert cliffs that rise above Cairo’s bustling streets. Called Zabbaleen, or “garbage people” in Arabic, most hail from the rural province of Assiut, 250 miles to the south. For generations, the Zabbaleen have served as Cairo’s de facto garbage collectors, earning a meager living hauling away city dwellers’ trash and recycling anything salvageable. Devout Christians, most residents in Manshiyat Naser attend services at St. Simon the Tanner, a Coptic church carved out of the face of a cliff dominating the neighborhood. Though some parishioners wish the church could do more for the community, the parish offers relief. For instance, it provides material assistance to orphans, widows and disabled persons. And it runs a nursery school, which enrolls some 500 boys and girls from the neighborhood. 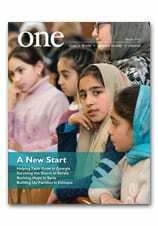 Read more about Salvaging Dignity in Cairo in the September 2012 issue of ONE.